There’s a corner of the garden that I rototilled earlier this spring but never got planted so the weeds were really out of control. I decided today it was time to re-till the area and do something with it. It was a real struggle to get the tiller to knock down those tall weeds but I managed to get most of them. On the second pass with the tiller I spotted what looked like a pair of under-sized, off-white, leather ping-pong balls. I recognized them right away, they were snapping turtle eggs. Snapping turtles spend almost their entire lives in the water. The only time they come out on to land is to lay eggs. I’ve seen websites that say snappers typically lay 20 to 40 eggs in a single clutch. The most I’ve ever found was 19 eggs several years ago in a different garden in another part of the state. Maybe you’ve seen more. Raccoons, skunks, foxes, crows and other predators love to eat turtle eggs. I’ve come across them in compost piles, piles of wood chips and mulch, flower beds and areas of loose sandy soil. Female snapping turtles will walk quite a distance to find a spot she thinks is best, up to a mile in some cases. This one was about two hundred yards away from the water. The problem I see with that is that the newly hatched turtles have to walk all the way back to the water. The farther away it is, the longer they are exposed to predators. Which brings up another question: how do the hatchlings know where the water is? 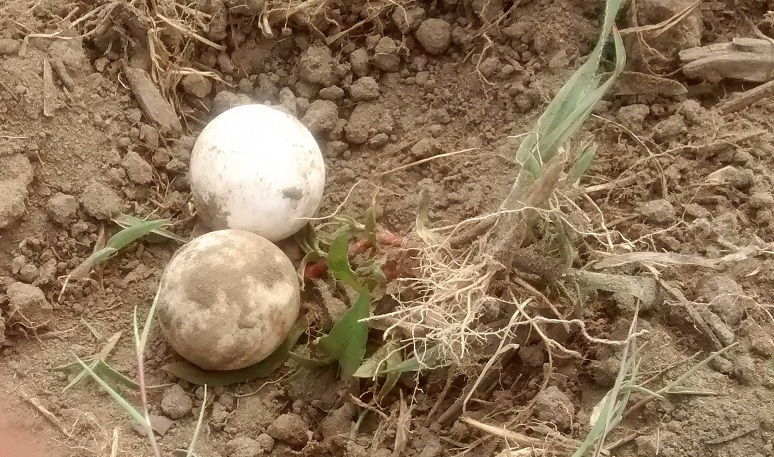 Back in the garden, I discovered I had inadvertently tilled up the entire nest and broke at least a half dozen eggs. None of them looked like they had any developed turtles inside. They just looked like tiny, off-colored scrambled eggs laying in the dirt. I took the two undamaged eggs and put them in a protected area where the pumpkins are growing. Now we’ll have two cute baby turtles in the neighborhood that will grow up to be mean, ugly grown-up snapping turtles.